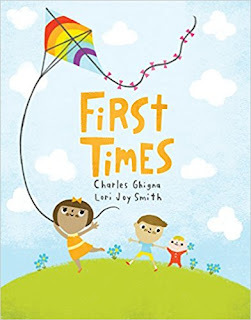 Congratulations to Connie Saunders and Jennifer Ervin for winning FIRST TIMES from last week's blog. 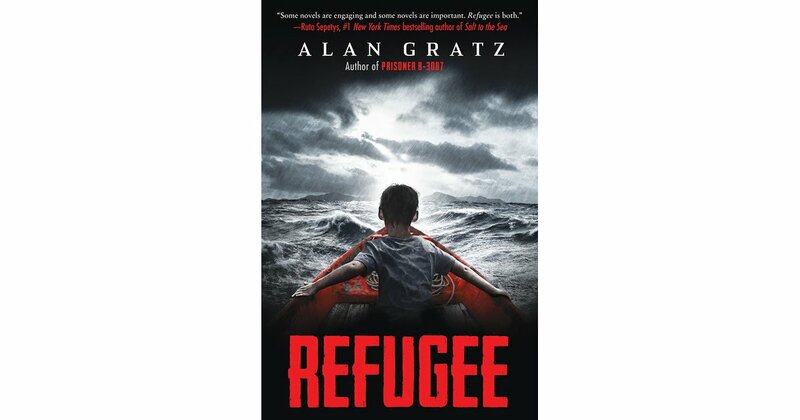 As promised last week, Alan Gratz has returned to share some of the intricate process of writing his middle grade novel, REFUGEE. CAROL: How much time did you spend researching REFUGEE? Was that typical for all your books? ALAN: I spent a month or two researching REFUGEE, which is typical for me. CAROL: Why did you pick the topic? ALAN: Writing about refugees was something I wanted to tackle. I empathize with the plight of refugees in today's world, and wanted to do something to bring that situation to the attention of school children, the way Linda Sue Park did with water in Africa and A LONG WALK TO WATER. CAROL: At what point in that process did you realize you were going to use three different characters in three different time periods? Did you plan it or did it “just” happen? Did you know the ending when you started writing? ALAN: I knew I was going to write a story about three different kids in three different time periods when I began researching and outlining the book. That decision--to tell three stories--took a while to come up with on its own. But as soon as I realized I could not only show parallels between each story, but actually link the three main characters and their families across time, that's when I knew I had a novel! CAROL: Each POV is a complete story. Did you write the 3 POV separately or concurrently the way the book appears? ALAN: I outlined each separately, all the way out--first Josef's story, then Isabel's, then Mahmoud's--although Isabel's story was created knowing what happened to Josef, and Mahmoud's knowing what happened to the other two children. Once I had all three stories outlined, then I wrote the book linearly. That is, I wrote Josef's first chapter, then Isabel's first chapter, then Mahmoud's first chapter, and so on and so on. CAROL: What system do you use to keep the research, plot lines, and characters straight? ALAN: I had a system I had developed over the years, but that has now been replaced by the awesomeness that is Scrivener. Scrivener is a great program for writers that allows you to store all your research and outline and story notes and character sketches in the same file with your manuscript--and it doesn't take a million years to load. You can click between separate screens very easily. It even has an outlining feature with faux note cards on the screen, but I prefer to do that by hand on the big pin board in my office. I'm a heavy outliner, and Scrivener allows me to keep all of my pre-writing notes in one place and at my fingertips when I'm writing. CAROL: You make writing look easy. 😀 How many drafts? ALAN: Including my outline--which, again, is pretty extensive--I did eight drafts of Refugee. The first drafts see the bigger things hammered out, and see major changes to the book's structure and characters. Beginning with the fifth draft, I'm focusing on much more specific problems. By the final drafts, I'm doing line editing. After the manuscript was finished, the Author's Note went through many more revisions than the book, as I tried to stay on top of all the changes happening in American politics and policy--both for the Syrian story AND, to my surprise, the Cuban story! CAROL: This isn’t your first multi-POV book. What have you learned in the process of writing books from several POV? ALAN: With multiple POV books, you have to be very careful to make sure that each POV character has a unique voice and character. 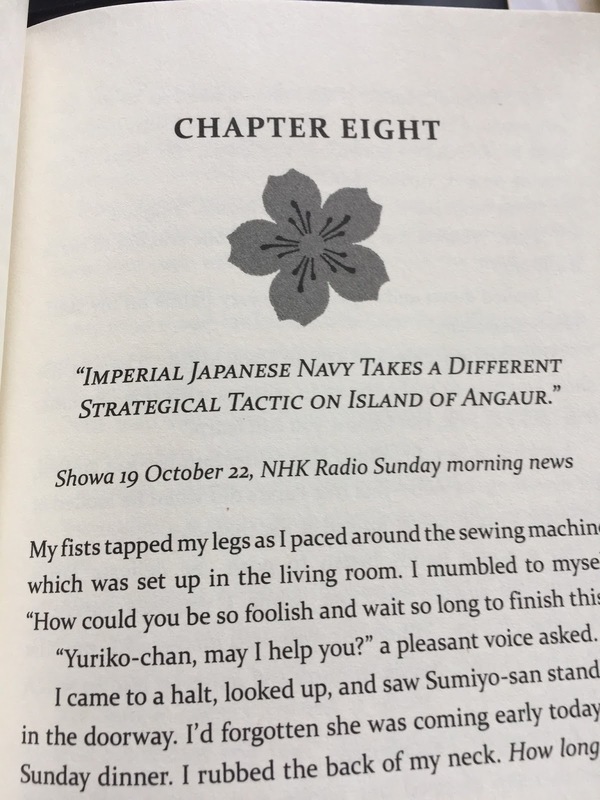 Ideally, you want the reader to know whose story they're reading just by the narration and dialogue, even without names or chapter titles. So I do a lot of work on the front end to develop my POV characters, and make sure they have rich, detailed lives off the page as well as on! Leave me a comment for a chance to win this amazing book. If you left a comment last week, I'll add another entry. MAKE SURE you leave me your email address if you are new to my blog! Random.org will choose a winner on September 28. 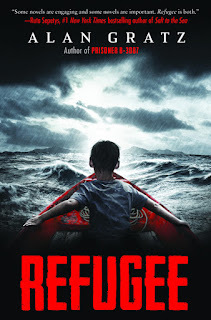 Like last week, if you also leave a comment through Talking Story, I'll give you another chance (PLUS there are other great books on this topic in the Refugee issue!). This is a busy week on my blog. TWO giveaways running concurrently! WARNING: Reading this book will make you stay up late and the characters will haunt you long after you finish reading it. 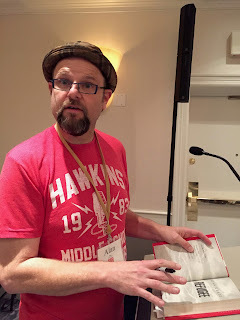 Readers of my blog are no strangers to Alan Gratz's books. You're a click away from seeing what I thought of Prisoner B-3087, The League of Seven, and Samurai Shortstop. And believe it or not, I still have Dragon Lantern on my TBR shelf. It's no use. I can't keep up with this t-shirt and jeans-always-in-a-hat favorite of SCBWI-Carolinas and now a NY Times Bestselling author! It's difficult to know how to review a book that takes the lives of three young people from three different periods of time, who are escaping from atrocities in three different countries and weaves them into one volume. Each chapter tells a different part of each refugee's story and each (see warning above) ends in a cliff-hanger. Masterfully written and entwined together, the reader never loses track of who is speaking and the events that character faces. In 1938, Josef Landau is a twelve-year-old German Jew who's family barely escapes the concentration camp. In 1994, Isabel Fernandez is an eleven-year-old who is hungry, musical, and afraid. Castro has been making life difficult for her and her fellow Cubans for years. In 2015, Mahmoud Bishara is a twelve-year-old stocky Syrian who prefers to stay invisible so that he can survive artillery shells and bombs. Although they are worlds and cultures apart, their stories intermingle. Their stories include broken glass, threatening soldiers, harrowing escapes, unbelievable obstacles, bodies of water which swallow family members, music, close-knit family ties, and heroism on each character's part. This scene takes place soon after Isabel's family escapes to Florida in a makeshift boat their neighbors built. While Mahmoud's family meets one obstacle after another as they seek to get to Germany, they meet a Palestinian refugee who left his home in 1948 during the first Arab-Israeli war. Since I was listening to Blood Brothers, the story of the displaced Palestinians (to be reviewed and given away soon)--this man's help to the Bishara family added another dimension to the history and plight of refugees. On their cobbled-together boat Isabel thinks about her beloved music. Floating on a dinghy in the Mediterranean Sea with his mother, Mahmoud is hoping to be rescued. In the dark he hears a boat, but can't see it. Alan expertly wraps up the three refugee's stories in an unexpected ending. This is a timely book that both adults and readers from ages 12 and up will enjoy; it is also be a tremendous curriculum resource. I am giving away a copy of REFUGEE in conjunction with the fall issue of Talking Story. Leave a comment here to enter once. Leave a comment through Talking Story and you'll have another chance! 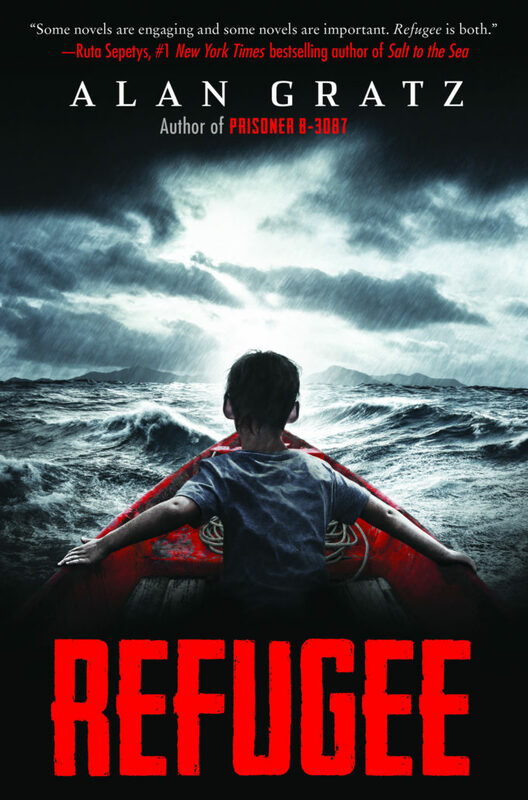 Come back next week for a look behind the scenes of writing REFUGEE. You'll have another chance to win the book! Giveaway ends September 28. I met poet and prolific writer Charles Ghigna (aka "Father Goose") several years ago at a reading and writing conference. Today, I am happy to introduce him, and his newest picture book, FIRST TIMES, to you. In this engaging book in rhyme, Charles shows several characters celebrating their "firsts." 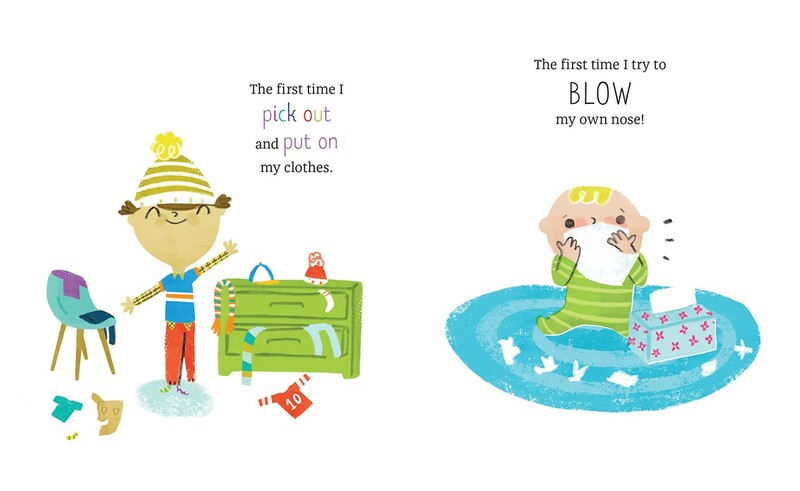 Delightfully illustrated by Lori Joy Smith, a young reader will identify with the pride and pleasure of brushing her hair, tying his shoes, riding his bike, or picking a book out from the library. Is there a better way to inspire young children than to praise every milestone accomplishment? "The idea hit me during one of my granddaughter's visits. We were at the park playing on her favorite slide when another little girl came by. The younger child stood at the bottom of the slide watching Charlotte Rose as she laughed and cheered her way down the slide. She then stopped to say something to the girl who promptly followed her on her next turn up the ladder. The little girl's eyes widened with joy as she slid down the slide. Charlotte Rose came by and whispered to me, "It's her FIRST TIME." Bam! My little six-year-old muse struck again. I spent the rest of the afternoon sitting on a nearby bench writing my new book, listening to the laughter of Charlotte Rose and her new friend. Like many of my books of the past few years, this one is dedicated to Charlotte Rose." writing space is actually a tree house! Teachers and home school educators, make sure you check out the lesson plan on Charles' website. Many of you reading this are in the Carolinas, but if you have friends or family in the Birmingham, Alabama area, information for his book launch is here. Pass it along! 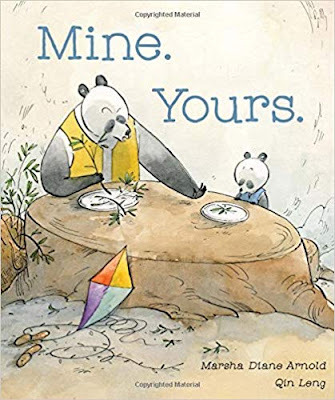 Orca books is giving away TWO copies of this lovely picture book for you to share with your favorite young reader. Please leave me a comment by September 22 and Random.org will pick a winner. For extra chances, share this on your social media of choice. 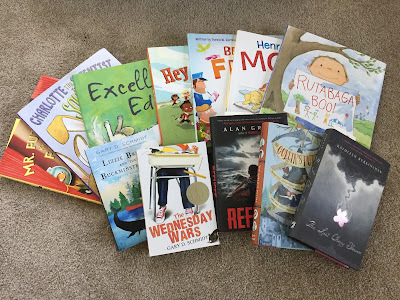 Tell me what you've done and if you are new to this blog, PLEASE leave me your email address in case you win! You Heard it Here First--Linda Phillips' Second Novel Finds a Home! As many of you know, I enjoy featuring my fellow writers' accomplishments. In that vein, I bring you news from my dear friend, Linda Phillips. 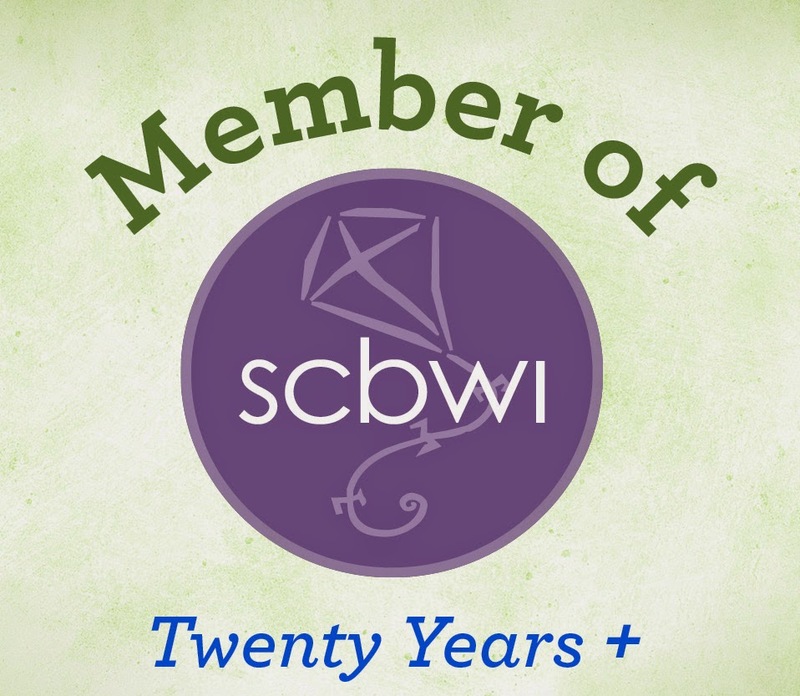 Just for the record, Linda and I met 18 years ago when Fran Davis, the regional advisor for SCBW (there was no I back then) asked us to put together the 1999 conference. Linda and I hadn't even met before! But we pulled it off and became prayer partners and writing buddies. Here's proof that we are really "joined at the hip" as Linda often jokes. 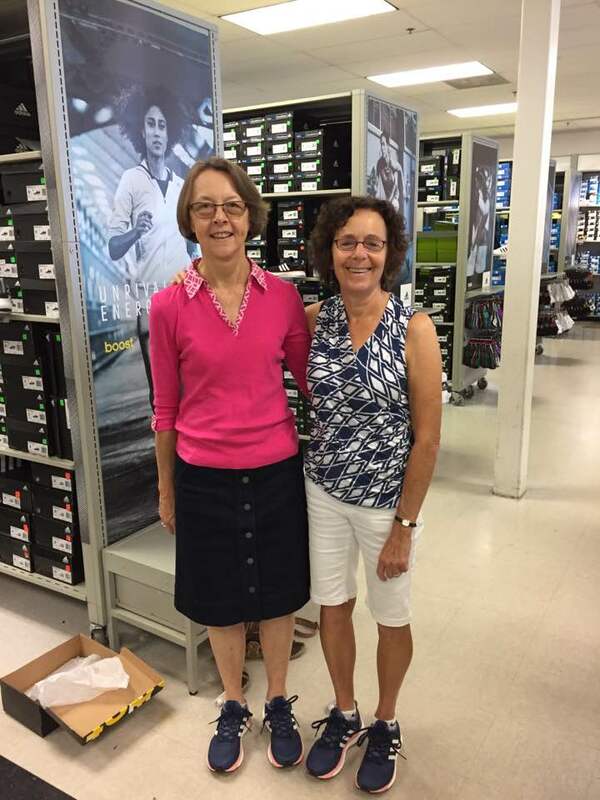 When we went shoe shopping recently, we chose the same pair! 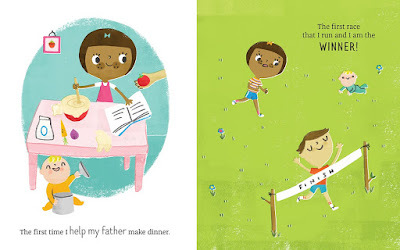 Without further ado, here's Linda to tell us about her next book. What's the Pitch for Heart Behind These Hands? Clair Fairchild is a teenage piano prodigy. When faced with the news that both her younger brothers are dying of a rare childhood disease, she must reshape her musical dreams. How did you come up with the idea for Heart Behind These Hands? While this is not a sequel to my debut novel, Crazy, the seed for the story is buried (unintentionally) deep in those pages. When I needed to assign a devastating disease to a minor character in Crazy, coming up with Batten disease wasn’t exactly random. I taught at The John Crosland School (formerly Dore Academy) and The Fletcher School, both of which serve students with learning differences. At Dore, we had a student who was diagnosed with Batten in the third grade, and his younger brother met the same fate shortly afterwards. At Fletcher a girl was ironically diagnosed by the same doctor in the same month. This neurodegenerative disease robs children of all vision, mobility, cognitive and language skills. None of them is expected to make it far into their twenties. The girl, Taylor King, has a family that has formed a foundation, Taylor’s Tale, that has raised many thousands of dollars for research. An older sister, Laura King Edwards, follows Taylor’s progress on her blog and has committed to running marathons in all fifty states to raise awareness. She has written a memoir, Run to the Light, documenting her first-hand experience watching the disease steal her sister’s life. The first thing I did when I wanted to pursue a book with Batten as the villain, was to check with Laura and make sure my plans to write a fictional novel-in-verse depicting characters with Batten did not conflict with her memoir. We’ve since read each other’s work and are celebrating that our books will both be released in the fall of 2018. We’ve started to discuss ideas about the marketing possibilities that may present themselves under these fortuitous circumstances. I began working on this book about ten months before Crazy came out. During that time, you were the first (as always) to read my first twenty pages and then I sent off the first draft to my agent, Julia Kenny before I went into debut book frenzy. 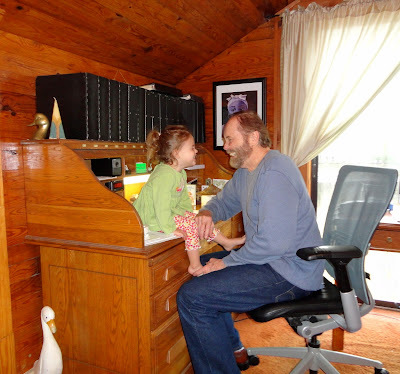 She and I exchanged three rounds of drafts over the next year before she sent the first submissions out in early 2016. It’s been wonderful having an agent both willing and able to step into the editorial role. We got some lovely, rosy rejections on that first round, and then a second round went out in Nov. 2016. It was met with silence. We both felt confident about the story and went into it with eyes wide open about the uphill battle that novels in verse can encounter. We even had some discussions about the fact that the country as a whole was in a particular, political funk at the time, because Julia said more than one of her clients was encountering the same eerie silence. If you find yourself in the same position, don’t dwell on these mysteries. Dive into the next thing as quickly as possible no matter how uninspired you feel at the moment. I did, and I’m better for it, and more than halfway into my third book. The second most wonderful thing about my agent is that she temporarily cut me loose from the contract to explore small presses on my own, while offering her assistance to review any offers. I spent about a week considering whether or not to try self-publishing and I quickly realized I lacked confidence in handling the process. I started sending out queries in January, one of which was to Light Messages, a publishing house represented at a joint WNBA/CWC meeting in March. When I mentioned that I had submitted to them the editor emailed me the next day saying she hadn’t received it. She requested it, we clicked, and I signed the contract shortly thereafter. Note about querying: don’t be shy about following up. You have nothing to lose and everything to gain, like a “misplaced” manuscript. I get this question a lot, and all I can say is it seems to be the way I think, or I should say, have thought. I started out just writing poetry, and moving into novels in verse was like floating down river on a lazy summer day. However, now that I look upstream and see the wake of ambiguities among readers, librarians, students and most of all, publishers, I’m going to hang up the rubber raft for now. That being said, to keep the metaphor going, in my current work in progress, I’m slogging along the bank in bare feet which requires a different set of skills. I now must write in complete sentences and use a truckload more words than I’m accustomed to. And then there’s all that punctuation and capitalization that needs to be addressed! But it’s all part of the journey and who amongst us writers doesn’t love the challenge of a brand new learning curve? Congratulations to Connie Saunders who won Sheri Levy's Starting Over ARC. Make a conscious decision about who your narrator is. If you're stuck, switch POV (even to an inanimate object or animal). Even if you don't use that narrator, your story will be informed by what you discover. Use long vowels to slow your story down. Short vowels speed things up. "Prose is solid, tight, and evocative." John had other suggestions as I go forward. The shift to middle grade will take some switching around in my head and on the page, but as I'm in the middle of another draft this is the time to do it. Since I tend to read middle grade more than young adult, I think that ultimately I'll be happy with this decision. Be ready to improvise when technology doesn't work the way you expect. Thanks to my gracious attendees who made my moment of "Oops, the LCD isn't projecting the online wikis as I expected," less of a panic situation and more a learning experience. There are several different narrative structures besides a straight linear one (Beginning, Middle, End.) The one that most interested me was pastiche. When I read Kathleen Burkinshaw's debut novel, The Last Cherry Blossom, I was intrigued by her use of headlines and snippets from radio broadcasts as part of her chapter headings. In fact, last week I was glued to the microfilm machine at the Charlotte public library searching articles from The Charlotte Observer, Charlotte News, and The Carolina Israelite for that purpose. Since I'm also including free verse and letters in Half-Truths, I'm glad to find a name for this type of novel! Example of a pastiche novel. Physical description must reveal character. Character should be revealed through ACTION. Not a decision to act. "Start as close to the end as possible." Kurt Vonnegut. Open with scene, not summary. 5 grandchildren = going a little crazy in the conference bookstore! Be careful of inner monologue that's not authentic. Hook your reader with emotion first. If you're writing historical fiction, make sure there is a good reason for placing it in the past. Be in the moment with your characters and scenes. "You are tackling a story that is not easy, yet you've made the effort to get feedback that was probably not easy to hear... and still, you keep on going. I am so proud of you and I think that you should be proud of yourself, too. Your tenacity encourages me to keep on keeping on - even when it's hard." I confess to fighting discouragement over how long it has taken to complete Half-Truths. But Donna looks at my journey and sees perseverance. Which goes to show that often--in life and in books--there are two points of view.